Election year always gets me thinking about the relationship of my American citizenship to my Christian faith, possibly even more so in this cycle. It seems to me these two identities are like the proverbial mixing of oil and water. Many attempt to stir them together with vigor, forcing them to blend and assimilate one another. However, when you stop stirring you clearly see that they naturally begin to separate. There is something so intrinsically different about the two that you can't make them into a happy, viable mixture. You can keep up the appearance of a successful blend if you keep stirring, but that's the only way. By birth I am an American citizen, and by a second birth I am a Christian. The former was simply directed by the providence of God without my awareness. I was an American before I even knew what an American was. I've been spending my whole life learning what this means. The latter was also directed by the providence of God, but with my awareness and participation. The gospel came to me, convicted me, drew me in, and I responded in faith with a commitment to follow Christ. I've been learning since I was ten-years-old what it means to be a disciple of Jesus. Historically, I think it is valid to talk about American Christianity. We can discuss persons, ideas, theological developments, denominations, revivals, conflicts and controversies, organizations and such things. However, the message of Christianity certainly transcends any cultural confines or peculiar expressions. Christianity must be expressed within a culture, but It ought never be confused with the culture (back to the oil and water metaphor). Therefore, those things that seem to be the defining characteristics of America (e.g. personal liberty, republicanism, individualism, materialism) should be placed under the scrutiny of the Christian faith at all times. There may be places of congruency for sure, but it's the places of tension to which we must pay close attention - the places at which no matter how hard we try to mix, when we stop stirring they just won't stay blended. I may be a Christian who is an American, but I'm not an American Christian. I deeply appreciate being American. I believe I have enough historical perspective to understand the uniqueness of the United States and what is good about it. In many ways what our founders established here and enshrined in our founding documents is exceptional in the development of western civilization, albeit informed by biblical and non-biblical sources. By comparison, although flawed, the American system has proven to be preferable to many others around the world. The millions who have fled to this country or chosen to leave home for a better opportunity for life give strong testimony to this claim. America also has it's scars left by ignoble practices and policies. America has to own its moments of brutality, unfairness, greedy self-interest, unwise or unjust warfare, and rejection of biblical principles and morality. Our history is what it is - a combination of the good and bad. I am simultaneously a citizen of twenty-first century America and the Kingdom of Heaven. In the first century Jesus spoke of the Kingdom of God as both breaking through in the present and something fully realized in the future. The challenge for me is to prioritize my citizenships by understanding the relevant biblical material and grasping how I should relate the one to the other. It is clear that no matter in what time, place, or under what form of government that we find ourselves, God has given a principle of submission to authority. Much discussion has taken place throughout Christian history about this idea. However, the idea itself cannot be questioned unless you want to call into question the authority of Scripture itself. Many do wonder at what point can a clearly oppressive government be resisted. This is a vexing question to which Scripture does not give us explicit directions. However, we do have certain examples in Scripture than can be applied. The Hebrew midwives resisted the Pharaoh's murderous orders to kill newborn boys. "But the midwives feared God, and did not do as the king of Egypt had commanded them, but let the boys live" (Exodus 1:17). Not only did they defy the Pharaoh, they also lied to him when he demanded an explanation. Additionally, we are told that God approved of the midwives' behavior. Another example of defiance is found in the story of the book of Daniel. Daniel had three friends that were exiles in Babylon. The narcissistic King Nebuchadnezzar had decreed that he was to be venerated through a huge golden image of himself. However, Daniel's friends (Hannaniah, Mishael, and Azariah) didn't have to think twice about such a command. They would certainly not bow down and worship (or even feign worship) to an idol and take from God what was only properly His. They would not submit. The Bible gives examples of those who rightfully did not submit to commands or expectations that squarely put them at odds with the clear will of God. Therefore, the Bible does not teach a tacit, unlimited submission to governing authorities. Those authorities can cross lines that conflict with obedience to God. However, on a daily basis we are clearly instructed to render submission and respect to the authorities that God in His providence has placed over us. We should consider carefully and seriously the teachings in the following texts. Let every person is to be in subjection to the governing authorities. For there is no authority except from God, and those which exist are established by God. 2 Therefore whoever resists authority has opposed the ordinance of God; and they who have opposed will receive condemnation upon themselves. 3 For rulers are not a cause of fear for good behavior, but for evil. Do you want to have no fear of authority? Do what is good and you will have praise from the same; 4 for it is a minister of God to you for good. But if you do what is evil, be afraid; for it does not bear the sword for nothing; for it is a minister of God, an avenger who brings wrath on the one who practices evil. 5 Therefore it is necessary to be in subjection, not only because of wrath, but also for conscience’ sake. 6 For because of this you also pay taxes, for rulers are servants of God, devoting themselves to this very thing. 7 Render to all what is due them: tax to whom tax is due; custom to whom custom; fear to whom fear; honor to whom honor. Submit yourselves for the Lord’s sake to every human institution, whether to a king as the one in authority, 14 or to governors as sent by him for the punishment of evildoers and the praise of those who do right. 15 For such is the will of God that by doing right you may silence the ignorance of foolish men. 16 Act as free men, and do not use your freedom as a covering for evil, but use it as bondslaves of God. 17 Honor all people, love the brotherhood, fear God, honor the king. Then the Pharisees went and plotted together how they might trap Him in what He said. 16 And they sent their disciples to Him, along with the Herodians, saying, “Teacher, we know that You are truthful and teach the way of God in truth, and defer to no one; for You are not partial to any. 17 Tell us then, what do You think? Is it lawful to give a poll-tax to Caesar, or not?” 18 But Jesus perceived their malice, and said, “Why are you testing Me, you hypocrites? 19 Show Me the coin used for the poll-tax.” And they brought Him a denarius. 20 And He said to them, “Whose likeness and inscription is this?” 21 They said to Him, “Caesar’s.” Then He said to them, “Then render to Caesar the things that are Caesar’s; and to God the things that are God’s.” 22 And hearing this, they were amazed, and leaving Him, they went away. In general, because of biblical precepts, we are to be respectful and submissive to those who govern us - even if we don't like them. We are to recognize the providence of God and trust the character of God who has established them, even if we deem our government dishonest and/or incompetent. We are to pay our taxes. We are to pray for those in authority as we honor them with our actions. Jesus himself spoke to this when He was questioned about it. He concisely addressed this dual citizenship for the believer, neither dismissing and making light of civic duty nor diluting devotion to God or mixing it with nationalism. He upheld both spheres of duty without confusing the two. Duty to country is one thing. Duty to God is another. The two are not necessarily hostile to one another, but sometimes they have been, such as with the Apostles among their own people, Christians in the Roman Empire, Anabaptists in Europe and the Confessing Church in Nazi Germany. Many other examples could be given. 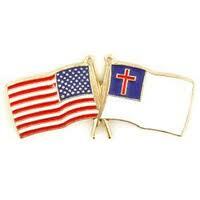 Allegiance to God must always trump any allegiance to my country when push comes to shove morally or theologically. On the opposite end of the spectrum from cynicism, a critical spirit, and a rebellious heart in regards to government is the glorification of country and an idolatrous patriotism. An undiscerning patriotism easily turns idolatrous. It can run right over that ultimate allegiance to God and can steal the glory from Him to whom it solely and rightfully belongs. In the Old Testament God asserts, “I am the Lord, that is My name; I will not give My glory to another,nor My praise to graven images" (Isaiah 42:8). In the Ten Commandments God alluded to this same idea when He declared, “You shall not make for yourself an idol, or any likeness of what is in heaven above or on the earth beneath or in the water under the earth. You shall not worship them or serve them; for I, the Lord your God, am a jealous God.."(Exodus 20:4-5). Because of the fact that God is God, He alone is worthy of our glory, praise, adoration, and devotion. Nothing should displace the worship and honor that is only rightfully His. Because this glory is rightfully His, it is completely proper for Him to be jealous for our devotion. Now, this is not to say that a believer ought not be a patriot. On the contrary, I believe that our Christian duty is to be patriotic and serve our country and be the best of citizens. As stated above we should honor our leaders and submit to authority. We should be willing to contribute to the common good and sometimes to make personal sacrifice. However, I must be careful not to elevate my love for country to the point that I lose perspective. My love of country must be filtered through the lens of my Christian faith. I have on more than one occasion watched Christian people be moved more by the American flag, patriotic songs, and recognition of veterans than by contemplation of the cross, songs of God's glory, and the preaching of the Gospel. And I'm talking about in the church building in a so-called God and Country worship service! The hearts swell with patriotic pride, the sentimental symbols move people to tears, and the stars and stripes gets the glory. I believe that if we had eyes to see more clearly, we would perceive what blasphemy it is to confuse this with worship. Now, don't take what I've just said the wrong way. I'm a patriot. I put on the uniform and serve my country. The Fourth of July is my favorite holiday (although I don't think there is actually anything particularly holy about it). However, I can't allow anything to share the limelight with God in worship. In addition, although I can be grateful for my American identity and the freedoms I enjoy, I am unwise to find my ultimate meaning in being American or to boast in my country. Scripture makes it crystal clear where I find my significance and what I ought to be most charged up about! Paul wrote, "But may it never be that I should boast, except in the cross of our Lord Jesus Christ, through which the world has been crucified to me, and I to the world" (Galatians 6:14). My Christian world-view encapsulates my identity as an American. Historically speaking, the United States of America is just one of the great political and military powers in human history. There is no reason to think that America's dominance in the world and the prosperity that comes with it will continue indefinitely. Every empire has risen to displace another, had it's period of dominance, and ultimately experienced decline and either oblivion or a transition to something less significant. Many believe that the signs that we are at the beginning of the end are already evident. We simply don't want to acknowledge it. If the second return of Christ is still in the distant future, there is no reason to assume that America will necessarily continue its economic and military dominance in the world. Augustine, in his mammoth City of God, contrasted what he called this perishing earthly city with the eternal city of God. (Someday, I'm going to actually read the whole work) The occasion for his writing this work was the fall of Rome in 410 to the Vandals. Augustine developed a philosophy of history within a Christian worldview. These two "cities" exist together and a believer is a citizen of each in this world, but it is only the city of God (i.e. the Kingdom of God) that perseveres gloriously for an eternity. Every earthly city (empire) will rise and fall and be terribly flawed along the way. Therefore, our hearts should be captive to that city of God, not to sinful, temporal, man-made countries. This is a huge work and has much more in it's content, but this is the gist of it. I do believe I have a sense of great appreciation for my American citizenship. I cherish the basic freedoms that are part of this culture. I count it a privilege that I will be able to go to the poll and cast a vote in the election of our next president. My guy may not win if I find myself on the side of the minority, but I am happy still that our votes decide the outcome (except that our antiquated electoral college system makes it possible for a candidate to receive a majority of the popular vote yet still lose the election). Not only is it a privilege to vote, I believe it is part of my Christian duty as a good citizen. There will never be perfect candidates, but I must choose between the two, deciding which one best inculcates principles, values and commitments that best line up with biblical, Christian ones. Notice I said, best not perfectly. I will hold on to my American identity because it is important to me; however, it is something that I must hold on to loosely. America is wonderful and imperfect; it is a land of freedom and idolatry; it is a perishing city of this world like all the rest. I will cling tenaciously to my Savior and He will ultimately hold on to me without failure. As a citizen of the city of God I know who my real King is and who is Lord and to whom every knee will eventually bow and every tongue confess to be the legitimate ruler of all. I want to declare my appreciation of America, but my total, undying allegiance will only and always be to my Savior, Jesus Christ the Lord. Yesterday I concluded a five-part series of messages designed to challenge boldly our church to be the church it ought to be under the Lordship of Christ. I last wrote in this blog on the day after the first of these messages, in which we experienced a tremendous response. That response sent me to musing about revival (see previous post). Now a month has passed since then and we have now concluded the series. It was a good month. The spirit within the congregation was good and on four of the five Sundays we saw people make commitments. Most significantly, we saw three yesterday make professions of faith in Christ as their Savior. Now, it's time to move on to what is next. However, I have the feeling that what we just experienced was not a neatly packaged "revival" time with a starting and ending. My prayer is that it was the beginning of a culture shift. My hope is that God is beginning to move in the hearts of many about what this "church thing" is really all about. My expectation is that this is the beginning of an increasing movement toward overall better spiritual health. There are many good evidences that this is happening. I believe that it's still possible that what we are in the beginning of revival that will only continue to progress and intensify. Our conception of revival is like a flash flood of enthusiasm. But what if it can be a gentle rain that simply persists, resulting in real and significant change? Again, time will tell and hindsight will let me better evaluate. But in the meanwhile, I'm praising God for the good work I see in people's lives, and praying that He will break our hearts over sin and fill our hearts with love for Him and people and bend our prideful, stubborn wills to His. I hope that in months or years ahead, I'll be able to look back and with confidence point to September 2012 as the beginning of a movement of God that brought dramatic change and growth to First Baptist Hazard.